In 2017, USC Viterbi's undergraduate-run Rocket Propulsion Lab's (RPL) Fathom II rocket reached an altitude of 144,000 feet, a world record for a vehicle designed and manufactured entirely by students. The road to this success was paved with persistent trial and error. 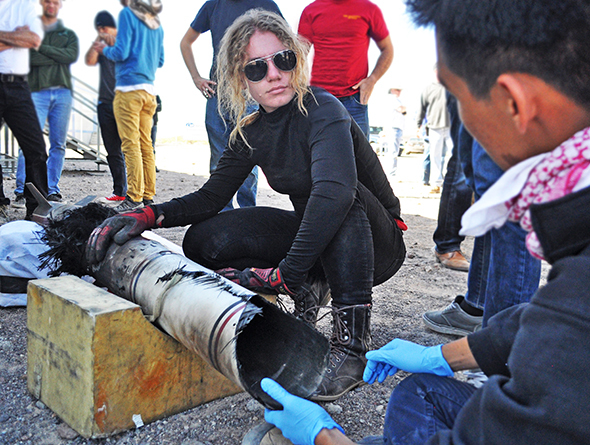 Mechanical Engineering major Sidney Wilcox examines a segment of scorched fuselage with Astronautical Engineering major Roberto Lopez, now a USC Viterbi alumnus working with a commercial space firm. Photo by Rocket Propulsion Lab. The USC Viterbi School of Engineering is innovative, elite and internationally recognized for creating new models of education, research and commercialization that are firmly rooted in real-world needs. The school's first priorities are the education of outstanding students and the pursuit and publication of new research. As the school's faculty and students extend the frontiers of engineering knowledge through their research, they also apply engineering and technology to address societal challenges. The school stimulates and encourages qualities of scholarship, leadership, ambition and character that mark the true academic and professional engineer — to serve California, the nation and the world. At USC Viterbi, we call this the enabling power of Engineering+. Courses in engineering were first offered at USC in the 1905–06 academic year in the basement of one of the oldest buildings on campus. Today, more than 300 full-time faculty, including 189 tenure-track faculty, serve about 2,600 undergraduate majors; over 600 students in minor programs; and about 5,700 graduate students, utilizing extensive and technically advanced laboratories, classrooms and live interactive high-speed Internet broadcast systems. Government and industry annually fund nearly $205 million worth of research. Viterbi undergraduate support programs complement and strengthen the academic experience, enhancing both depth and scope. Viterbi graduate education is outstanding preparation for advanced research and professional careers. The PhD program is built around fellowships, teaching assistantships and research appointments, and produces a steadily growing core of doctoral graduates across the disciplines. The master's and professional programs are national and global leaders in advanced training for professional engineers. The Viterbi School of Engineering offers the following undergraduate curricula leading to the Bachelor of Science in: Aerospace Engineering; Applied Mechanics; Astronautical Engineering; Biomedical Engineering; Chemical Engineering; Civil Engineering; Computer Engineering and Computer Science; Computer Science; Computer Science/Business Administration (with the Marshall School of Business); Computer Science (Games); Electrical Engineering; Environmental Engineering; Industrial and Systems Engineering; Mechanical Engineering; and Physics/Computer Science (with the Dornsife College of Letters, Arts and Sciences). Minor programs are offered in: 2-D Art for Games (with the Roski School of Art and Design and the School of Cinematic Arts); 3-D Art for Games (with the Roski School of Art and Design and the School of Cinematic Arts); 3-D Computer Graphics and Modeling; Applied Analytics; Applied Computer Security; Astronautical Engineering; Computer and Digital Forensics; Computer Programming; Computer Science; Connected Devices and Making; Construction Planning and Management (with the Price School of Public Policy); Craniofacial and Dental Technology (with the Herman Ostrow School of Dentistry and the Dornsife College of Letters, Arts and Sciences); Engineering Management; Enterprise Information Systems; Environmental Engineering; Innovation: The Digital Entrepreneur (with the Marshall School of Business); Internet of Things (IoT) Engineering; Mobile App Development; Nanotechnology; Petroleum Engineering; Technology Commercialization (with the Marshall School of Business); Video Game Design and Management; Video Game Programming; and Web Technologies and Applications. Graduate curricula leading to the Master of Science in: Aerospace Engineering; Aerospace and Mechanical Engineering (Computational Fluid and Solid Mechanics); Aerospace and Mechanical Engineering (Dynamics and Control); Analytics; Applied Data Science; Astronautical Engineering; Biomedical Engineering; Biomedical Engineering (Medical Imaging and Imaging Informatics); Chemical Engineering; Civil Engineering; Civil Engineering (Construction Engineering); Civil Engineering (Structural Engineering); Civil Engineering (Transportation Engineering); Civil Engineering (Transportation Systems); Civil Engineering (Water and Waste Management); Communication Data Science; Computer Engineering; Computer Science; Computer Science (Computer Networks); Computer Science (Computer Security); Computer Science (Data Science); Computer Science (Game Development); Computer Science (High Performance Computing and Simulations); Computer Science (Intelligent Robotics); Computer Science (Multimedia and Creative Technologies); Computer Science (Scientists and Engineers); Computer Science (Software Engineering); Cyber Security Engineering; Data Informatics; Electrical Engineering; Electrical Engineering (Computer Architecture); Electrical Engineering (Computer Networks); Electrical Engineering (Electric Power); Electrical Engineering (Multimedia and Creative Technologies); Electrical Engineering (VLSI Design); Electrical Engineering (Wireless Health Technology); Electrical Engineering (Wireless Networks); Engineering Management; Environmental Engineering; Financial Engineering; Global Supply Chain Management (with the Marshall School of Business); Green Technologies; Health Systems Management Engineering (with the Price School of Public Policy, not currently accepting applications); Industrial and Systems Engineering; Manufacturing Engineering; Materials Engineering; Materials Science; Mechanical Engineering; Mechanical Engineering (Energy Conversion); Medical Device and Diagnostic Engineering; Operations Research Engineering; Petroleum Engineering; Petroleum Engineering (Geoscience Technologies); Petroleum Engineering (Smart Oilfield Technologies); Product Development Engineering; Public Policy Data Science (with the Price School of Public Policy); Spatial Data Science; and Systems Architecting and Engineering. Graduate curricula leading to the Master of Construction Management and the Master of Communication Informatics. Graduate curricula leading to dual degrees in: Master of Science Aerospace Engineering / Master of Science Engineering Management; Master of Science Electrical Engineering / Master of Science Engineering Management; Master of Science Industrial and Systems Engineering / Master of Business Administration; Master of Science Mechanical Engineering / Master of Science Engineering Management; Master of Science Systems Architecting and Engineering/Master of Business Administration; and Master of Science Petroleum Engineering / Master of Science Engineering Management. Graduate curricula leading to the Engineer degree in: Aerospace Engineering; Astronautical Engineering; Chemical Engineering; Civil Engineering; Electrical Engineering; Environmental Engineering; Industrial and Systems Engineering; Materials Science (not currently accepting applications); Mechanical Engineering; and Petroleum Engineering. Through the Graduate School, graduate curricula leading to the Doctor of Philosophy in: Aerospace Engineering; Astronautical Engineering; Biomedical Engineering; Chemical Engineering; Civil Engineering; Computer Engineering; Computer Science; Electrical Engineering; Engineering (Environmental Engineering); Industrial and Systems Engineering; Materials Science; Mechanical Engineering; and Petroleum Engineering. Graduate certificates in: Astronautical Engineering; Health Systems Operations (with the Price School of Public Policy); Health, Technology and Engineering (with the Keck School of Medicine); Network Centric Systems; Oilfield Technologies; Optimization and Supply Chain Management (with the Marshall School of Business); Software Architecture; Systems Architecting and Engineering; and Transportation Systems (with the Price School of Public Policy). The Bachelor of Science degrees in aerospace engineering, astronautical engineering, biomedical engineering, chemical engineering, civil engineering, computer engineering and computer science, electrical engineering, environmental engineering, industrial and systems engineering, and mechanical engineering are accredited by the Engineering Accreditation Commission of ABET, abet.org. The Bachelor of Science degrees in computer engineering and computer science and in computer science are accredited by the Computing Accreditation Commission of ABET, abet.org. USC undergraduate students who have not been admitted to the Viterbi School of Engineering may apply to add an engineering major with the approval of the associate dean for admission for the Viterbi School. Students interested in adding an engineering major must go through the pre-engineering process (viterbiundergrad.usc.edu/pre-engineering/). Approval is granted on the basis of academic performance at USC and in the required prerequisite courses in the Viterbi School. A minimum total of 128 acceptable units is required to earn the Bachelor of Science in Engineering. Exceptions are: aerospace engineering, 129 units; biomedical engineering with an emphasis in electrical engineering, 133 units; biomedical engineering with an emphasis in mechanical engineering, 132 units; chemical engineering, 134 units; chemical engineering with an emphasis in biochemical engineering, 138 units; chemical engineering with an emphasis in environmental engineering, 137 units; chemical engineering with an emphasis in nanotechnology, 133 units; chemical engineering with an emphasis in petroleum engineering, 138 units; chemical engineering with an emphasis in polymer/materials science engineering, 138 units; civil engineering, 133 units; civil engineering with an emphasis in building science, 137 units; civil engineering with an emphasis in environmental engineering, 130 units; civil engineering with an emphasis in structural engineering, 133 units; environmental engineering, 132 units. The university's general education program provides a coherent, integrated introduction to the breadth of knowledge you will need to consider yourself (and to be considered by other people) a generally well-educated person. This program requires eight courses in six Core Literacies, plus writing and two courses in Global Perspectives (which may double-count with courses in the Core Literacies). See the General Education Program for more information. Students in the Viterbi School of Engineering must satisfy the general education requirements. Students satisfy Core Literacy requirements in life sciences, physical sciences, and quantitative reasoning with the basic science and mathematics elements of their undergraduate engineering programs. Students in the engineering "3-2" program are not required to satisfy general education requirements or the lower-division writing requirement for USC; these students are understood to have satisfied USC's general education requirements when they have satisfied the general education requirements and lower level writing requirement at their previous institution. All students must, however, complete the WRIT 340 requirement. All students must complete a minimum of 64 units at USC in order to receive a USC degree. In addition, the Viterbi School of Engineering requires that students complete all upper-division units required for the major in residence. For students in the Viterbi School of Engineering "3-2" Program, at least 48 units must be earned in courses taken at USC. For graduation with a bachelor's degree, a grade point average of C (2.0) or higher is required in all upper-division courses applied toward the major including any approved substitutes for these courses taken at USC. Additional scholarship requirements for the various majors are listed under the departmental headings. Each semester, students on academic probation are required to receive academic advisement. Proof of advisement must be filed with the Academic Review Department before any registration requests will be processed. The only acceptable proof of advisement is an official academic review advisement record signed by the student's academic adviser and a representative from the Viterbi Admission and Student Affairs Division. Academic review advisement forms may be obtained from Tutor Hall of Engineering (RTH) 110 or John Hubbard Hall 113. The office is responsible for working with both prospective and continuing students. It directs special services and programs, provides a variety of support services, sponsors student organizations, is involved with student government and acts as a liaison with other university offices. The Viterbi Admission and Student Affairs Division enables engineering students to maximize their potential at USC. The Center for Engineering Diversity (CED) provides a variety of services for historically underrepresented students in engineering (African-American, Hispanic and Native American students, including women). The Women in Engineering Program (WIE) offers professional, academic and co-curricular support to the women of the Viterbi School. The goal of the Viterbi Women in Engineering Program is to recognize the unique challenges that female engineering students will face, provide resources and overall support to address these challenges, and allow our female students to find academic and personal success during their Viterbi career and beyond. Contact the Women in Engineering Program at (213) 740-4530 for more information. The Klein Institute for Undergraduate Engineering Life (KIUEL) was established to provide Viterbi undergraduates with a variety of personal and professional activities designed to enhance undergraduate engineering student life experiences outside the classroom. The KIUEL Programming Board implements programs around leadership, service learning and globalization, and cross-disciplinary learning. Past KIUEL events have included the KIUEL Weekend for Leaders, the KIUEL Showcase and the Senior Design Expo. Every year, a select group of promising incoming first-year students is invited to join the Viterbi Fellows Program. The program provides pathways and opportunities to maximize their potential and develop as community leaders starting in their first semester. Fellows engage in a combination of opportunities and experiences, both academic and co-curricular. Each Viterbi Fellow receives a Merit Research Award to get involved in research with our faculty from their first semester. In addition to giving students excellent first-hand experience, these awards can help offset the cost of education since each participant earns wages for his or her work. Viterbi Fellows are also granted priority consideration for many of the Viterbi School programs, including iPodia, the Viterbi Summer Overseas Program, and entrepreneurial programs. Fellows also receive special invitations to events such as the Fellows' Dinner with the Dean, Employer Networking Events, Leadership Seminars, and co-curricular events. The Viterbi School encourages students to pursue their academic and co-curricular involvement keeping the "Grand Challenges" in mind. The USC Viterbi Grand Challenges Scholar Program (GCSP) helps students organize their time spent focused on exploring results that benefit society. Each year, the top students who successfully complete the USC Viterbi GCSP areas will be named National Academy of Engineering Grand Challenges Scholars, recognized both by USC at graduation and the National Academy of Engineering. For more information, contact the Viterbi Admission and Student Affairs Division office in RTH 110. The First Year Excellence (FYE) program helps first-year students develop strong connections to the university and the Viterbi School of Engineering. FYE promotes academic exploration and success through its co-curricular programs, support services and resources during students' first year. Freshman academies, introductory courses and the Alumni Spotlight Series help guide students as they explore engineering. Academic advisers work with all freshman students to ensure they are on track academically and to assist with acclimating to college life and USC. Free tutoring, group-led supplemental instruction sessions, workshops and seminars on time management and networking with faculty are available to students to assist them in accomplishing their goals. The Viterbi School of Engineering provides extensive career services to all students. Our philosophy is that the more frequently students engage in co-curricular activities combined with their academic programs, the more successfully they can compete in the job market. Students are encouraged to register with Viterbi Student Engagement and Career Connections during their first year at USC via the Viterbi Gateway portal. By doing so, they will be kept informed of all career-related events such as company information sessions, career preparation workshops, industry luncheons and career fairs. In addition, students are able to participate in the school's extensive on-campus interview program. USC's Viterbi School of Engineering attracts employers not only from Southern California, but from across the country. A few of the many companies that have recently hired co-ops, interns and permanent employees from the Viterbi school include: Abbott Laboratories; Accenture; Adobe Systems Inc.; Akuna Capital LLC; Amazon Corp. LLC; Apple; BlackRock, Inc.; Bloomberg L.P.; Blue Origin; The Boeing Company; Chevron; Citrix Systems, Inc.; Deloitte Financial Advisory Services; Edwards Lifesciences Corp.; eBay; Inc., Ernst & Young, Expedia, Inc., Facebook, Inc., General Atomics-Aeronautical System Inc., General Electric, Google, Intel Corp., IBM, Intuit, Inc., Jet Propulsion Laboratory, Juniper Networks, Inc., LinkedIn, Lockheed Martin Corporation, Medtronics, Inc., Microsoft Corporation; NBC Universal; NASA; Northrop Grumman Corporation; Oracle Corp.; Parsons Corporation; Paypal; Qualcomm; Raytheon Company; Salesforce.com, Inc.; Snapchat; SpaceX; Symantec Corp.; Tesla; Texas Instruments Inc.; The Aerospace Corp.; Turner Construction; U.S. Air Force; Veritas Technologies; Visa Inc.; Walt Disney Imagineering and Yahoo Inc.
By participating in the Co-op Program, students can earn degree credit and industry work experience before they graduate. Co-op improves students' understanding of the relationship between theory and practice, helps them fine-tune their career goals and aids in the acquisition of important engineering skills. Students' work assignments are closely related to their specific degree program and are appropriate to their current academic level. Participation in the program is open to all full-time undergraduate engineering majors. Students are eligible to apply for Co-op the second semester of their sophomore year. Though the sequence may vary, students typically have one summer work experience in addition to one semester immediately preceding or following one of the summer sessions. While on assignment, students enroll in a 1–2 unit course (ENGR 395a , ENGR 395b , ENGR 395c , ENGR 395d ) that aids in the integration of both on-campus and off-campus learning. With departmental approval, credit toward a degree may be earned upon completion of this course. For those students wishing greater depth and breadth in the liberal arts, the Viterbi School of Engineering has developed agreements with more than 20 liberal arts colleges nationwide in which a student attends a liberal arts institution for his or her first three years of college, pursuing pre-engineering courses in addition to a solid program in the liberal arts. At the end of the three years, upon recommendation from the liberal arts college, the student applies to the Viterbi School of Engineering as a junior and, if admitted, completes the remaining requirements for a BS degree typically within two years. After degree requirements for both schools are complete, the student will receive two degrees — a BA from the liberal arts college and a BS from USC. Every summer the Viterbi School of Engineering sponsors a seven-week academic program in either Florence, London, Paris, Madrid, Rome or another location that provides students with the opportunity to enroll in engineering and elective courses. This program is open to all engineering majors. The Viterbi School of Engineering International Exchange Program gives undergraduate students the opportunity to broaden their exposure to the global context of engineering theory and practice by spending a semester abroad in a challenging academic environment at an international host institution. The International Exchange Program allows students to satisfy technical electives and/or approved degree requirements by attending approved partner institutions. This program is open to students entering their junior or senior year. Students apply at the Viterbi Student Affairs Office. Candidates must meet all admission requirements of both the Viterbi School of Engineering as well as those of the international host institution. Contact the Admission and Student Affairs Office for a complete list of international exchange partners. The Viterbi School of Engineering has established a variety of honor societies to recognize academic excellence, creativity and service. These are: Alpha Pi Mu (industrial and systems engineering), Chi Epsilon (civil engineering), Eta Kappa Nu (electrical engineering), Omega Chi Epsilon (chemical engineering), Omega Rho (industrial and systems engineering), Pi Tau Sigma (mechanical engineering), Sigma Gamma Tau (aerospace engineering), Tau Beta Pi (nationwide honor society) and Upsilon Pi Epsilon (computer science). The Viterbi School of Engineering recommends candidates for the Master of Science degree in: aerospace engineering, analytics, astronautical engineering, biomedical engineering, chemical engineering, civil engineering, computer engineering, computer science, cyber security engineering, data informatics, electrical engineering, engineering management, environmental engineering, financial engineering, green technologies, health systems management engineering, industrial and systems engineering, manufacturing engineering, materials engineering, materials science, mechanical engineering, medical device and diagnostic engineering, operations research engineering, petroleum engineering, product development engineering, spatial informatics, and systems architecting and engineering; and the Master's degree in construction management. Several areas of emphasis and specialization are available within these disciplines. All graduate work in the Viterbi School of Engineering is under the jurisdiction of the Viterbi School except the Doctor of Philosophy degree, which is under the jurisdiction of the USC Graduate School. All prospective graduate engineering students should apply to the USC Office of Graduate Admission. Two classes of students are admitted to take courses for graduate credit: admitted and conditionally admitted students. These classifications are determined by the Office of Graduate Admission on the recommendations of the appropriate department in the Viterbi School of Engineering. This is the status of a graduate student pursuing work leading toward an advanced degree. The student has been accepted into the degree program without any conditions. The chair of a major department in the Viterbi School of Engineering may recommend that a student be admitted under certain conditions. Conditional admission is granted when a student's admission records are incomplete or when deficiency courses must be taken but the student appears to be otherwise admissible. The conditions must be met before the completion of two semesters of enrollment or 12 units of course work, whichever comes first. If the conditions on admission are not met within the given time period, the student may not be allowed to register for course work in subsequent semesters. When the conditions have been met, the academic department will remove the restrictions that have been placed on the student's registration. To qualify for admission, applicants are expected to present strong academic records and show superior accomplishment in their engineering and related courses. Admission decisions will be based on Graduate Record Examinations test scores and transcripts of previous school work. Individual departments may set higher admission standards than the Graduate School. Some programs also require letters of recommendation and a statement of purpose. Doctor of Philosophy applicants who have published professional papers in their field may forward copies to the department, and they will be considered together with the other credentials submitted. Applicants to graduate programs must present credentials to the Office of Graduate Admission showing that they have completed an acceptable curriculum for the bachelor's degree. In some departments students with outstanding records will be admitted for the doctoral program without first receiving the Master of Science degree. If the previous degree is not in the field in which the student wishes to pursue graduate study, it may be necessary to make up undergraduate deficiencies in the area of the desired specialty. Applicants must take the Graduate Record Examinations. Satisfactory scores on the general test are required for admission to full graduate standing in most programs. Consult the department office for further information. Once the application for admission has been sent, arrangements should be made immediately to have official transcripts of all previous undergraduate and graduate school work forwarded directly to the Office of Graduate Admission from the schools attended. If the Graduate Record Examinations general and subject tests, as well as the TOEFL or IELTS exams, have been taken the scores should be sent to the Office of Graduate Admission by the educational testing service. If the tests have not been taken, the applicant should register to take them on the earliest available date. The departments will review the application files and select for admission those students offering the greatest promise for completing graduate studies. The progressive degree program allows qualified undergraduate students the opportunity to complete an integrated program of study joining a bachelor's degree program and a master's degree program in the same or different departments. Applicants for a progressive degree program must have completed 64 units of course work applicable to their undergraduate degree since graduating from high school. (Credit by exam and course work taken prior to high school graduation are excluded). Applicants must submit their application prior to completion of 96 units of course work. Normally, the application is submitted in the fall semester of the third year of enrollment at USC. The application for admission to a progressive master's program must be accompanied by a departmentally approved course plan proposal and two letters of recommendation. All application materials can be obtained from the Viterbi Admission and Student Affairs Office (RTH 110, viterbiundergrad.usc.edu/future/pdp/. Progressive degree program students must fulfill all the requirements for both the bachelor's degree and the master's degree. The total number of units for the master's degree, however, may be reduced by a maximum of one-third. A minimum of two-thirds of the units required for the master's degree must be at or above the 500 level, excluding any 590 courses. Students will be subject to undergraduate academic progress standards and policies while in undergraduate status and master's academic progress standards and policies while in graduate status. The degrees may be awarded separately, but the master's degree will not be awarded before the undergraduate degree. The time limit for completing a progressive degree program is 12 semesters. For more information, refer to the Requirements for Graduation page. Viterbi students are allowed up to five years to earn a master's degree. Depending on the specific degree, the typical time required varies from between one and one-half to two years for students in MS programs oncampus to three years for MS students completing their degrees online via DEN@Viterbi. Master's degrees other than the Master of Science typically require more course work, and may take more time to complete. Students entering the Viterbi School of Engineering with course or credit deficiencies require a correspondingly longer period. A candidate must complete the last four semester units of course work at USC. No more than 25 percent of the minimum units required for the program will be accepted from another engineering school upon verification by the Office of Degree Progress and the approval of the major department. Prerequisite is a bachelor's degree in engineering, allied fields or science. If the graduate field is different from the field of the bachelor's degree, there may be undergraduate deficiencies assigned by the major department, and these must be made up by taking and passing the assigned courses before proceeding with the graduate courses. New students may be required to demonstrate satisfactory preparation for the graduate program with previously completed course work. In cases where preparation is not demonstrated, up to 9 units of deficiency course work may be required in addition to the normal degree requirements. Credit for required deficiency courses may not be applied toward a graduate degree. A deficiency course within the same discipline taken after the higher level course has been passed will not be available for unit or grade point credit. Enrollment in certain 500- and 600-level courses in the disciplines of computer engineering and electrical engineering will require a student to either take and pass the corresponding 400-level prerequisite at USC, or pass a placement exam in the corresponding course. Not all 400-level prerequisite courses taken instead of a placement exam are available for degree credit. No unit or grade point credit is given for placement exams. Please consult with an academic adviser or refer to the department Website for information on specific courses and placement exam details. A grade point average (GPA) of 3.0 (A = 4.0) is required for the master's degree in all engineering programs. The minimum GPA must be earned on all course work applied toward the master's degree and on all 400-level and above course work attempted at USC beyond the bachelor's degree. A minimum grade of C (2.0) is required in a course to receive graduate credit. Work graded C- or below is not acceptable for subject or unit credit toward any graduate degree. Transfer units count as credit (CR) toward the master's degree and are not computed in the grade point average. There are two program options for the master's degree, one with a thesis and the other without. Courses are selected to fit the special needs of individual students, must form an integrated program leading to a definite objective and must be approved in advance by the department. Only courses numbered 400 and above may be applied for degree credit. The minimum requirement is 27 units; 18 of these units must be at the 500 level and at least 18 units must be in the major department and closely related departments. Prior department approval is required for all non-major courses. Specific requirements are listed under each department. The minimum requirement is 27 units; 4 of these units are to be thesis. At least 16 units, not including thesis, must be at the 500 level or higher, and at least 18 units must be in the major department. Two units of 594a and 2 units of 594b are required. No more than 4 units of 590 Directed Research is permitted. The thesis, when it is required, is regarded as an important part of the work of the candidate for a master's degree. It must be a serious, considerable and publishable piece of work demonstrating the writer's power of original thought, thorough grasp of the subject matter and ability to present material in a scholarly manner and style. The thesis presents the results of an investigation of an approved subject in the major department. It is supervised throughout by a thesis committee, appointed by the chair of the student's major department. The committee is usually composed of two members of the major department and one other member of the faculty. The student will register in courses 594a and b respectively during the final two semesters of the master's program as determined by discussion with an adviser. (Concurrent registration for 594a and b during the same semester is permitted when a student's progress makes completion of all requirements likely within one semester.) If the thesis has not been completed within these two semesters, the candidate must register for 594z each semester until the thesis has been accepted but no additional unit credit will be earned. Units of 594ab Master's Thesis may not be converted to units of 590 Directed Research. A student readmitted to candidacy by petition to the Graduate School must reregister for 594a and 594b. Final acceptance of the thesis is based upon the recommendation of all members of the thesis committee. For requirements concerning format of master's thesis see The Graduate School section of this catalogue. Candidates who find it necessary to be excused from registration in 594a or 594b for a semester must formally report before the beginning of the semester to the Viterbi Office of Graduate and Professional Programs that they will be inactive during that semester and request a leave of absence. During a leave of absence a candidate will not be entitled to assistance from the thesis committee or to the use of university facilities. The granting of a leave of absence does not change the candidate's responsibility for meeting the time schedule for the completion of degree requirements. Leave will be granted only under exceptional circumstances. Graduate students are expected to make regular progress toward their degrees as defined by the faculty of their respective departments and within the time limits allowed. Graduate students' progress and performance are reviewed each semester. Students making unsatisfactory progress receive a formal written warning and are placed on a semester of academic warning with specific conditions to be met for continuation in the program. Please refer to catalogue sections Academic Warning and Dismissal of Graduate Students; Grade Point Average Requirements; and the Website of the Office of Graduate and Professional Programs (GAPP) at viterbi.usc.edu/gapp. Prior departmental approval is required for non-major courses to be taken and applied toward a graduate degree. Students must consult with the faculty adviser for formal written permission to take courses outside the major department for degree credit. A copy of the faculty adviser's written approval must be kept in the department file and retained by the student until graduation. It is expected that work for a Master of Science in Engineering will be completed within a maximum of five calendar years. An academic department may grant an extension of up to one year at a time for a maximum of two years. Courses taken more than seven years prior to the date upon which the degree is to be awarded cannot be included for the degree. Application for admission to candidacy for the Master of Science is a separate step from admission to graduate standing. The requirements for admission to candidacy are: (1) the applicant must be admitted to regular graduate standing and must have removed all undergraduate deficiencies, and (2) the applicant must submit a complete program approved by the major department showing the course work, research and thesis (if required). Application for graduation should be made at the beginning of the semester in which the requirements for the master's degree are to be completed. Students are strongly advised to file for graduation as soon as the registration process has been completed so that their names may appear in the printed Commencement program and so that any discrepancies in their records may be resolved. Late filing may delay conferral of the degree. Application forms for graduation with the master's degree may be obtained from the student's academic department. This application should be returned to the student's academic department. Changes in the program after admission to candidacy are made by petition to the student's academic department. A graduate student who already holds a master's degree from USC may apply a limited number of previously earned units toward the second master's degree. The maximum number of units allowed for transfer is: 4 units in degree programs requiring 24–32 units; 8 units in programs requiring 33–40 units; 12 units in programs requiring 41 or more units. In all cases, permission of the chair of the major department is required. All credit, including the units from the first master's degree, must be earned within seven calendar years. For students who earned their first master's degree at another institution, no course work may be repeated from the first program of study and no unit credit from the first program of study may be counted toward the second master's degree. The Viterbi School does not currently offer degree programs with the Master of Engineering designation. The Engineer degree is awarded under the jurisdiction of the Viterbi School of Engineering. This degree is granted upon completion of a comprehensive curriculum beyond the general course requirements for the Master of Science and after successfully passing an engineer's qualifying examination. The required curriculum is intended to give students broad preparation in two areas of engineering, together with a minimum number of units in these areas to prepare them for the interdisciplinary nature of the many complex problems they will encounter in practice today. The degree is also intended to fulfill a growing need in industry for students with comprehensive advanced engineering training, but not necessarily with the research orientation developed by the PhD student. The Engineer degree is a terminal degree. Students who complete the Engineer degree will not be considered for admission to the PhD program. The Engineer degree is offered in aerospace engineering, astronautical engineering, chemical engineering, civil engineering, electrical engineering, environmental engineering, industrial and systems engineering, materials science, mechanical engineering and petroleum engineering. There are three basic prerequisites for the Engineer Degree Program: a Master of Science degree or completion of 27 units of acceptable course work, application for admission to the Viterbi School of Engineering and acceptance to the program by the appropriate department. The Engineer degree requires a minimum of 30 units of graduate course work beyond the Master of Science degree; up to 6 units at the 400 level may be counted at the discretion of the student's qualifying exam committee if the committee finds them necessary for the student's program. The course work must form a balanced program of study leading to a definite concentration in two fields of engineering, a minimum of 12 units in one field, nine in another; nine units are elective and may be taken outside the Viterbi School of Engineering, but must be acceptable for graduate credit. The distribution of course work will be governed by the student's qualifying exam committee and should be considered in conjunction with the course work done for the Master of Science degree. A candidate for the Engineer degree may substitute a project under the supervision of a faculty member for 6 units of course work. To have the project credited toward the degree, the student must register in 690 Directed Research during the course of the project; total 690 Directed Research registration should not exceed 6 units. A student wishing to work on a project must make arrangements with a member of the faculty to supervise and evaluate work, and obtain the approval of the committee chair prior to completing more than 15 units of course work. In many cases, the project may be related to the candidate's work outside the university but must still be supervised by a faculty member. Distribution of the course work should take into account the nature of the project. A minimum grade point average of 3.0 must be earned on all course work applied toward the Engineer degree. This average must also be achieved on all 400-level and above course work attempted at USC beyond the bachelor's degree. A minimum grade of C (2.0) is required in a course to receive graduate credit. Work graded C- or below is not acceptable for subject or unit credit toward any graduate degree. Transfer units count as credit (CR) toward the Engineer degree and are not computed in the grade point average. A candidate must complete the last four units of course work at USC. At least 26 units must be taken in residency at USC. A maximum of 4 transfer units not counted toward a previous degree may be allowed with adviser approval. After being granted graduate standing, the student must form a guidance committee. The committee is made up of three full-time faculty members who are specialists in the student's areas of concentration, with at least two from the major department. Forms to appoint the committee are available from the student's academic department. The student is responsible for finding a faculty member from one area of concentration who will act as the chair of the guidance committee. The chair will assist in selection of the other members. Advisement of the student after formation of the committee will be by the committee chair. The student must satisfactorily complete an engineer's qualifying examination administered by his or her guidance committee. This examination will cover both areas of concentration and will consist of at least one written and one oral examination. This examination is normally taken during the last semester of course work toward the degree. Students who choose to take the examination in the semester following the completion of course requirements may do so up until the end of the third week of classes without registering. After that date, they must register for GRSC 810 to maintain continuous enrollment in the program. Results of the examination are reported to the Viterbi Office of Graduate and Professional Programs and forwarded to the Office of Academic Records and Registrar. Up to 4 units of graduate course work may be transferred from an accredited institution to be applied toward the Engineer degree. Transfer work must have been done after receipt of the Master of Science degree and must be approved by the qualifying exam committee. A student who receives the Master of Science degree at USC may reserve a limited number of units taken prior to the receipt of the Master of Science degree for credit toward the Engineer degree. To reserve credit, the course must have been taken during the last semester as a Master of Science candidate, not used toward the Master of Science degree, be acceptable to the student's committee, and approved by the Office of Degree Progress. The student must complete all requirements within five calendar years. After satisfactorily completing the qualifying examination, and no later than the beginning of the last semester of course work, the student must file for candidacy. This is a separate and distinct step which sets forth the entire academic program fulfilling the degree requirements and is used as a working basis for awarding the degree. This degree is granted under the jurisdiction of the USC Graduate School. Students should also refer to the Requirements for Graduation section and the Graduate School section of this catalogue for general regulations. All courses applied toward the degree must be courses accepted by the Graduate School. Thirteen Doctor of Philosophy (PhD) programs are offered: aerospace engineering, astronautical engineering, biomedical engineering, chemical engineering, civil engineering, computer engineering, computer science, electrical engineering, engineering (environmental engineering), industrial and systems engineering, materials science, mechanical engineering and petroleum engineering. There is no foreign language requirement for engineering majors. Satisfactory completion of at least 60 units of approved graduate level course work with a cumulative grade point average of at least 3.0 is required of all PhD students in engineering. A minimum grade of C (2.0) is required in a course to receive graduate credit. Work graded C- or below is not acceptable for subject or unit credit toward any graduate degree. Undergraduate prerequisites and graduate course work will be required in accordance with the regulations of the major department or program and the recommendations of the student's qualifying exam committee. Transfer units are subject to approval by the Office of Degree Progress (for course work taken at institutions in the United States) or by the Office of Graduate Admission (for course work taken at institutions outside the United States) and by the qualifying exam committee. The original admission decision admitting a student to the PhD program is based on the student's previous academic records, Graduate Record Examinations scores and other evidence of scholastic abilities indicating promise for completing graduate studies. It is also a prerequisite that all PhD students successfully complete the screening procedures designated by the department. These usually consist of a written and an oral examination administered by the faculty. Students who fail the screening procedure will be advised that they are not recommended to continue in the PhD program and that any additional work may not be counted toward the degree. The PhD student's program of study is supervised by the qualifying exam committee, which is formed immediately after passing the screening examination. The committee consists of five tenure-track faculty members, four from the major department and one from outside the department. Reporting the screening procedures and forming the qualifying exam committee are accomplished by filing the appropriate forms obtainable from the Graduate School Website, usc.edu/schools/GraduateSchool. The qualifying examinations are taken during the last semester of the second year of graduate study or, at the latest, in the fifth semester or equivalent. The Request to take the Qualifying Examinations must be filed in the semester prior to taking the examinations and at least 30 days before beginning the examinations. The examinations are intended to determine the extent of the student's knowledge in basic science and engineering areas as well as the ability to do original and scholarly research. The qualifying exam committee decides the nature of the qualifying examinations (both oral and written portions) according to the policies applicable in each department. If not otherwise enrolled, a student must enroll in GRSC 800 during the semester in which the qualifying examination is to be taken. Students are strongly encouraged to take the qualifying examination during the first semester in which they are enrolled in GRSC 800 , and may not enroll in more than two semesters of GRSC 800 before taking the qualifying examination. The examinations may be scheduled at any time during the semester provided that all members of the committee are available to administer them. All portions of the examinations must be completed within 60 days. After passing the qualifying examinations the PhD student is admitted to candidacy by the Graduate School and the dissertation committee is established. After this step, students will normally engage in at least one year of full-time graduate study and research on campus. An acceptable dissertation based on original investigation and supervised directly by the dissertation committee is required. The dissertation must show mastery of a special field, capacity for independent research and a scholarly result. Candidates are expected to keep all members of the dissertation committee informed of their progress at all stages of the dissertation. After satisfactorily meeting all other requirements and after the research and writing of the dissertation are substantially complete, the PhD candidate must pass a general final oral examination devoted to the major field and to the topic of the dissertation. The examination will be conducted in such a manner as to determine to the satisfaction of the dissertation committee that the candidate has attained the stage of scholarly advancement and power of investigation demanded by the university for final recommendation to the doctorate. The faculty are invited to attend and to participate in the final oral examination. However, only the dissertation committee may vote. Unanimous approval of the committee is required for the student to upload the dissertation to the Graduate School. The requirements and regulations set forth in this portion of the catalogue are to be construed as the minimal requirements only as established by the Graduate School. In addition, students must meet all the requirements established by their department. Established in 1972, DEN@Viterbi, the USC Viterbi School of Engineering's online delivery system is a pioneer in the distance learning arena, using cutting-edge technology to enable professional engineers to take USC engineering courses for graduate degree credit without coming to the campus. DEN@Viterbi students enrolled around the world are pursuing over 40 graduate degree programs online — more choices than at any other research university. DEN@Viterbi breaks down geographical and scheduling barriers, allowing students to take classes anytime and anywhere, with the option for live interactivity. DEN@Viterbi students receive support from administrative and technical staff, and enjoy access to all services the Viterbi School has to offer. The Viterbi School has made it possible for all on-campus students enrolled in the school's graduate courses to receive free access to the archived lectures of courses offered via DEN@Viterbi. This valuable study aid enables students to review lectures throughout the semester. For more information about the Viterbi School graduate programs and DEN@Viterbi, visit viterbi.usc.edu/gapp.